Around the neighborhood, there are numerous nook-and-crany streets that dead into one of the canyons. 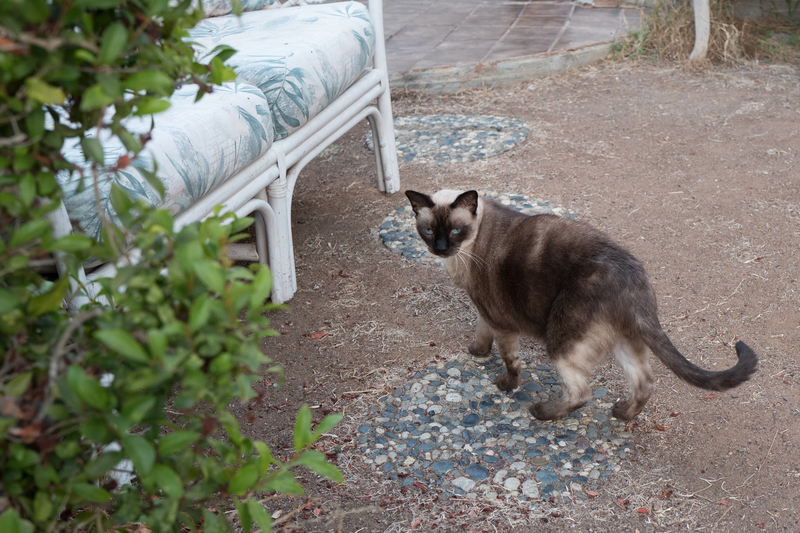 Last night, I walked down several of them, for the first time in months, seeing a meandering, slow-moving siamese in one of the yards along Proctor Place. The kitty approached me, initially. But when kneeling down to shoot, over a low-lying brick wall, I inadvertently nudged a green grated-metal door, which creaked. The furball stopped, but did not rush away. Rather, the kitty slowly strolled across the yard to an open security door and vanished. I captured the Featured Image at 5:52 p.m. PDT, about 40 minutes before sunset. But dusk had come early, moved along by Westerly cloud cover. I used Leica Q, manually presetting aperture and shutter speed. Vitals: f/4, ISO 320, 1/125 sec, 28mm. Photo was cropped for composition but otherwise is not retouched. I give nickname Crystal because of the eyes, which demand your closer inspection. Previously featured felines: Scruffy, Roly Poly, Woo, Skull, Biscuit, The Colonel, White, Chipper, Frisky, Stretch, Needy, Farfisa, Mates, Hunter, Pee-Pee, Blue, Blue Too, Bonded Pair, Patience, Fess, Jumper, Frenemy, Looker, Cozy, Scout, Lurks, Skit, Mini, Betty, Black and White, Stalker, Bell, Chill, Sammy, Scratch, Poser, Star, Grey and White, Watcher, Herman, Comet, Roman, Willow, Chub, Nimbus, Watson, Lilo, Kit, Pepe, Twilight, Sebastian, Spot, Booger, Ash, Veruca, Riley, Mellow, Bonde, Flower, Glass, Black, BeBe, Fang, Bruce, Siamese, Pounce, Tortie, Haiku, Fraidy, Peso, Daniel Tiger, Dusk, Stride, Dainty, Spry, Tabby, Betty Too, Still, Levi, Shadow, Sophie, Wink, Ferals, Momma, Charlie, Tux, Cool, Benny, Jellicle, Itchy Valentino, Goldie, Nine, Amanda, Siesta, ChaCho, Charlie, Too, and Mika.